The Earring Collection: "Northern Lights"
Magical, mysterious labradorite is a favourite amongst The Earring Collection team. An Inuit legend says that the Northern Lights were once imprisoned in rocks on the Canadian coast, until a brave warrior freed most of them with a blow from his spear. Those that remained in the rock are the cause of the beautiful, rainbow-like iridescence. blues, violets, oranges, green or even all these colours at once. a magical display of shimmer and iridescence. 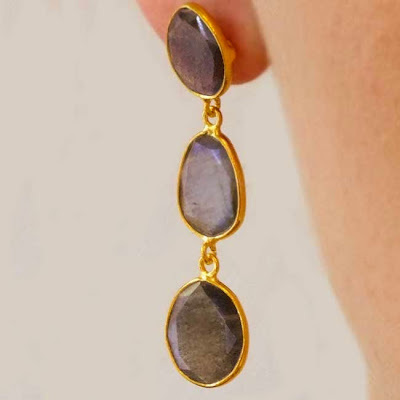 These earrings make a perfect finishing touch to an evening dress!